A clast is a fragment of rock or mineral, ranging in size from less than a micron (too small to see) to as big as an apartment block. 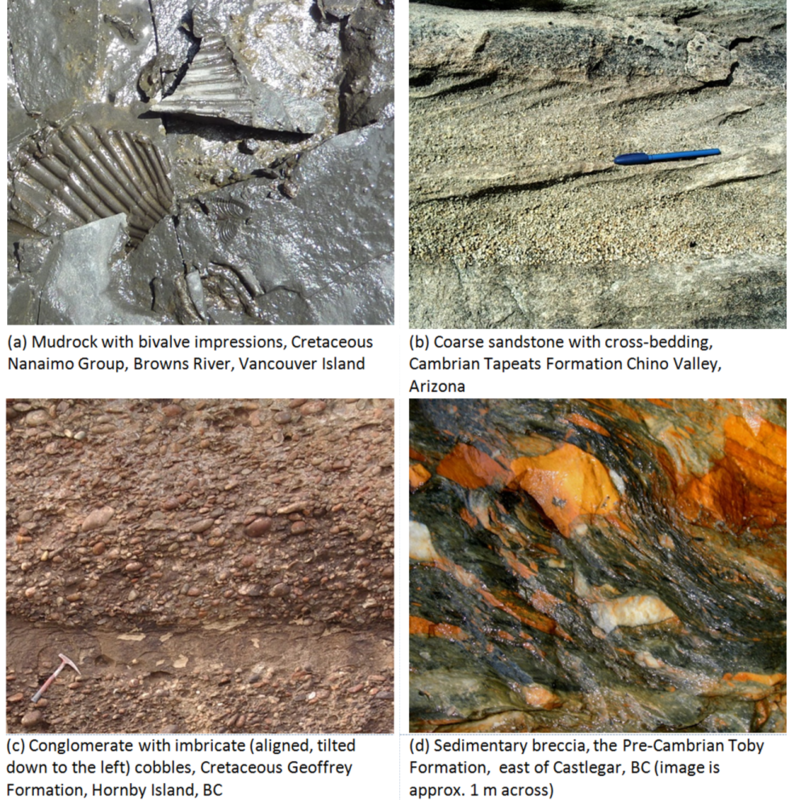 Various types of clasts are shown in Figure 5.12 and in Exercise 5.3. The smaller ones tend to be composed of a single mineral crystal, and the larger ones are typically composed of pieces of rock. As we’ve seen in Chapter 5, most sand-sized clasts are made of quartz because quartz is more resistant to weathering than any other common mineral. Most clasts that are smaller than sand size (<1/16 mm) are made of clay minerals. Most clasts larger than sand size (>2 mm) are actual fragments of rock, and commonly these might be fine-grained rock like basalt or andesite, or if they are bigger, coarse-grained rock like granite or gneiss. 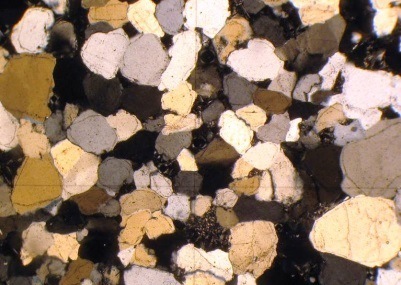 Geologists that study sediments and sedimentary rocks use the Udden-Wentworth grain-size scale for describing the sizes of the grains in these materials (Table 6.1). If you drop a granule into a glass of water, it will sink quickly to the bottom (less than half a second). If you drop a grain of sand into the same glass, it will sink more slowly (a second or two depending on the size). A grain of silt will take several seconds to get to the bottom, and a particle of fine clay may never get there. The rate of settling is determined by the balance between gravity and friction, as shown in Figure 6.3. 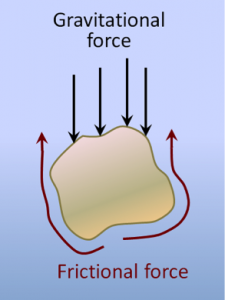 Figure 6.3 The two forces operating on a grain of sand in water. Gravity is pushing it down, and the friction between the grain and the water is resisting that downward force. Large particles settle quickly because the gravitational force (which is proportional to the mass, and therefore to the volume of the particle) is much greater than the frictional force (which is proportional to the surface area of the particle). For small particles it is only slightly greater, so they settle slowly. One of the key principles of sedimentary geology is that the ability of a moving medium (air or water) to move sedimentary particles, and keep them moving, is dependent on the velocity of flow. The faster the medium flows, the larger the particles it can move. This is illustrated in Figure 6.4. Parts of the river are moving faster than other parts, especially where the slope is greatest and the channel is narrow. 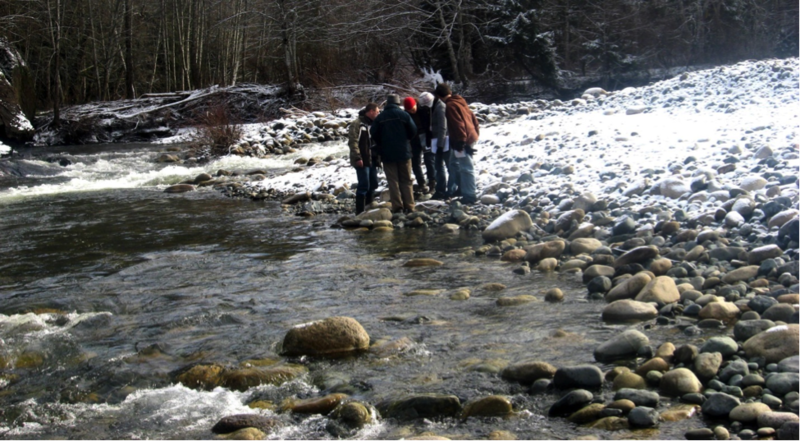 Not only does the velocity of a river change from place to place, but it changes from season to season. Figure 6.4 Variations in flow velocity on the Englishman River near Parksville, B.C. When the photo was taken the river was not flowing fast enough anywhere to move the boulders and cobbles visible here, but it is fast enough when the discharge is higher. Clasts within streams are moved in several different ways, as illustrated in Figure 6.5. 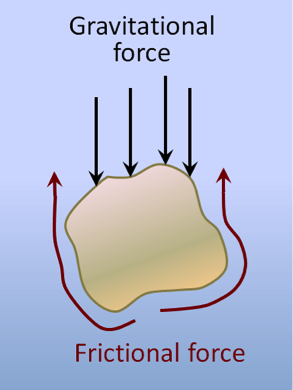 Large bedload clasts are pushed (by traction) or bounced along the bottom (saltation), while smaller clasts are suspended in the water and kept there by the turbulence of the flow. As the flow velocity changes, different-sized clasts may be either incorporated into the flow or deposited on the bottom. 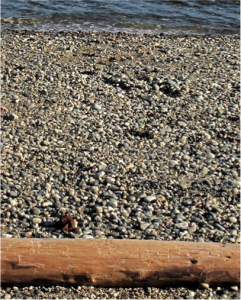 At various places along a river, there are always some clasts being deposited, some staying where they are, and some being eroded and transported. This changes over time as the discharge of the river changes in response to changing weather conditions. Figure 6.5 Transportation of sediment clasts by stream flow. 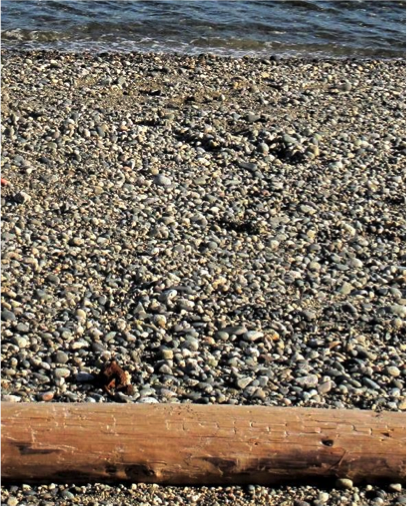 The larger clasts, resting on the bottom (bedload), are moved by traction (sliding) or by saltation (bouncing). Smaller clasts are kept in suspension by turbulence in the flow. 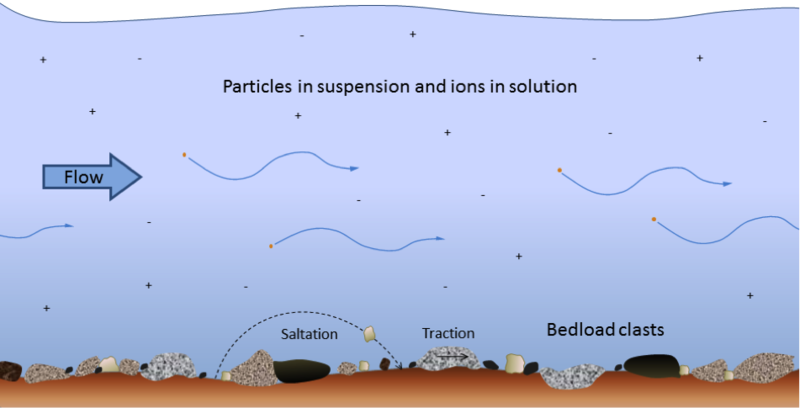 Ions (depicted as + and – in the image, but invisible in real life) are dissolved in the water. The characteristics and distinguishing features of clastic sedimentary rocks are summarized in Table 6.2. Mudrock is composed of at least 75% silt- and clay-sized fragments. If it is dominated by clay, it is called claystone. If it shows evidence of bedding or fine laminations, it is shale; otherwise it is mudstone. Mudrocks form in very low energy environments, such as lakes, river backwaters, and the deep ocean. Table 6. 2 The main types of clastic sedimentary rocks and their characteristics. It’s worth taking a closer look at the different types of sandstone because sandstone is a common and important sedimentary rock. Typical sandstone compositions are shown in Figure 6.6. The term arenite applies to a so-called clean sandstone, meaning one with less than 15% silt and clay. Considering the sand-sized grains only, arenites with 90% or more quartz are called quartz arenites. If they have more than 10% feldspar and more feldspar than rock fragments, they are called feldspathic arenites or arkosic arenites (or just arkose). 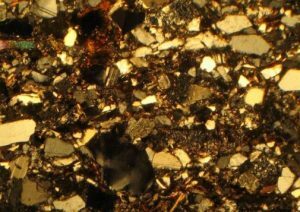 If they have more than 10% rock fragments, and more rock fragments than feldspar, they are lithic arenites. A sandstone with more than 15% silt or clay is called a wacke (pronounced wackie). The terms quartz wacke, lithic wacke, and feldspathic wacke are used. Another name for a lithic wacke is greywacke. Clastic sedimentary rocks in which a significant proportion of the clasts are larger than 2 mm are known as conglomerate if the clasts are well rounded, and breccia if they are angular. Conglomerates form in high-energy environments where the particles can become rounded, such as fast-flowing rivers. Breccias typically form where the particles are not transported a significant distance in water, such as alluvial fans and talus slopes. Some examples of clastic sedimentary rocks are shown on Figure 6.8. 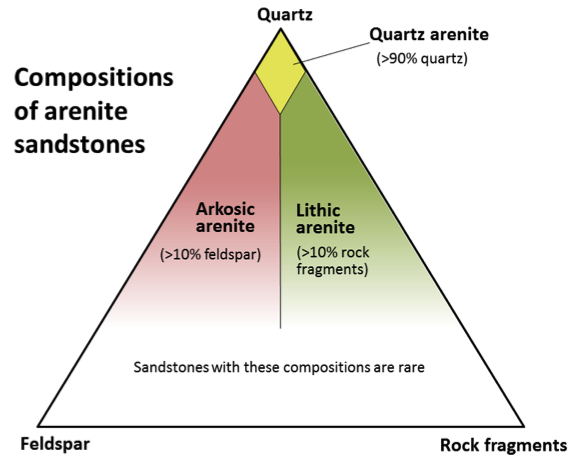 Figure 6.6 A compositional triangle for arenite sandstones, with the three most common components of sand-sized grains: quartz, feldspar, and rock fragments. Arenites have less than 15% silt or clay. Sandstones with more than 15% silt and clay are called wackes (e.g., quartz wacke, lithic wacke). 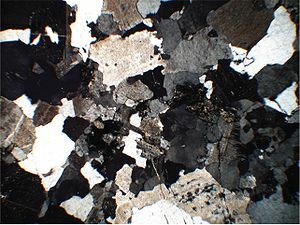 Figure 6.7 Photos of thin sections of three types of sandstone. Some of the minerals are labelled: Q=quartz, F=feldspar and L= lithic (rock fragments). The quartz arenite and arkose have relatively little silt-clay matrix, while the lithic wacke has abundant matrix. 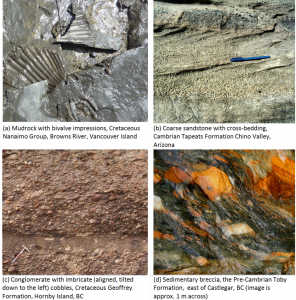 Figure 6.8 Examples of various clastic sedimentary rocks. 6.1 Clastic Sedimentary Rocks by Steven Earle is licensed under a Creative Commons Attribution 4.0 International License, except where otherwise noted.